Fragments of genomic DNA of Scots pine (Pinus sylvestris L.) homologous to the mitochondrial DNA (mtDNA) contigs of Norway spruce (Picea abies (L.) Karst.) and loblolly pine (Pinus taeda L.) were resequenced in a sample of the Scots pine trees of European, Siberian, Mongolian, and Caucasian origin in order to develop mtDNA markers. Flanking non-coding regions of some mitochondrial genes were also investigated and resequenced. Five single nucleotide polymorphisms (SNPs) and a single minisatellite locus were identified. Caucasian samples differed from the rest by three SNPs. Two SNPs have been linked to an early described marker in the first intron of the nad7 gene, and all together revealed three haplotypes in European populations. 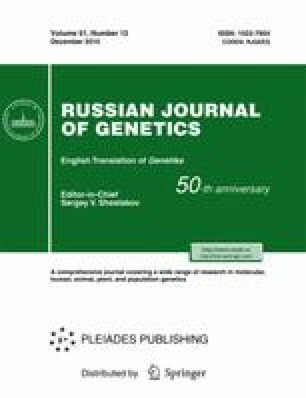 No variable SNPs were found in the Siberian and Mongolian populations. The minisatellite locus contained 41 alleles across European, Siberian, and Mongolian populations, but, this locus demonstrated a weak population differentiation (F ST = 5.8), probably due to its high mutation rate. Published in Russian in Genetika, 2015, Vol. 51, No. 12, pp. 1386–1390.